BARCELONA, Spain (AP) — Fernando Torres started bidding farewell to Atletico Madrid on Sunday by scoring in a 3-0 win over Levante that strengthened his team's hold on second place in the Spanish league. Angel Correa and Antoine Griezmann put Atletico ahead before substitute Torres scored in his first match since announcing that he would leave his boyhood club at the end of the season. The former Spain standout will now have six more league matches for Atletico, along with a minimum of two legs of the Europa League semifinal against Arsenal. "For me every game I have left is a party, you can see how the fans are with us," Torres said. "I hope that goal isn't my last." Atletico remained 11 points behind undefeated Barcelona with six rounds remaining, meaning its best chances of finishing the season with silverware rest in the Europa League. Atletico will visit Arsenal in the first leg of their semifinal on April 26. Correa opened the scoring for the hosts in the 33rd minute. The Argentine midfielder received a short pass from Victor "Vitolo" Machin and used a quick change of foot to fire past three defenders. Griezmann wasted a one-on-one situation with Oier Olazabal shortly before halftime when he was booked for diving after contact with the goalkeeper. But the France forward made up for it in the 47th when he used one touch of his right boot to blast in a waist-high pass from Sime Vrsaljko for his team-high 19th league goal of the season. Griezmann was replaced shortly after by Torres, who volleyed in a pass by Correa in the 77th to the delight of fans at Wanda Metropolitano Stadium. The 34-year-old Torres announced on Monday that his second stint with Atletico was nearing its end. The striker starred for Atletico from 2001-07 before going to Liverpool and Chelsea, where he won Champions League and Europa League titles. He returned to Spain in 2015 in the hope of winning an elusive title with the club he has always called home, although his playing time has dwindled in the last two seasons. "Fernando is an icon for his club, regardless of whether he scores goals or wins titles," Atletico coach Diego Simeone said. "He has his place in this club." Torres' goal on Sunday was his 127th for Atletico, making him the club's fifth highest all-time scorer. He has not revealed his plans for the future, but has said he still wants to play. Atletico striker Diego Costa did not play against Levante as he recovers from an injury to his left hamstring. Levante is the last team above the relegation zone, with five points separating it from the drop. Francisco "Isco" Alarcon scored one goal and set up another to lead Real Madrid to a 2-1 win at last-place Malaga. The victory allowed Madrid to move ahead of Valencia and into third place, 15 points behind leader Barcelona. Madrid manager Zinedine Zidane dropped forwards Cristiano Ronaldo and Gareth Bale, midfielder Luka Modric and defender Raphael Varane from the squad to give them extra rest as Madrid looks toward its Champions League semifinal against Bayern Munich, with the first leg in Germany on April 25. 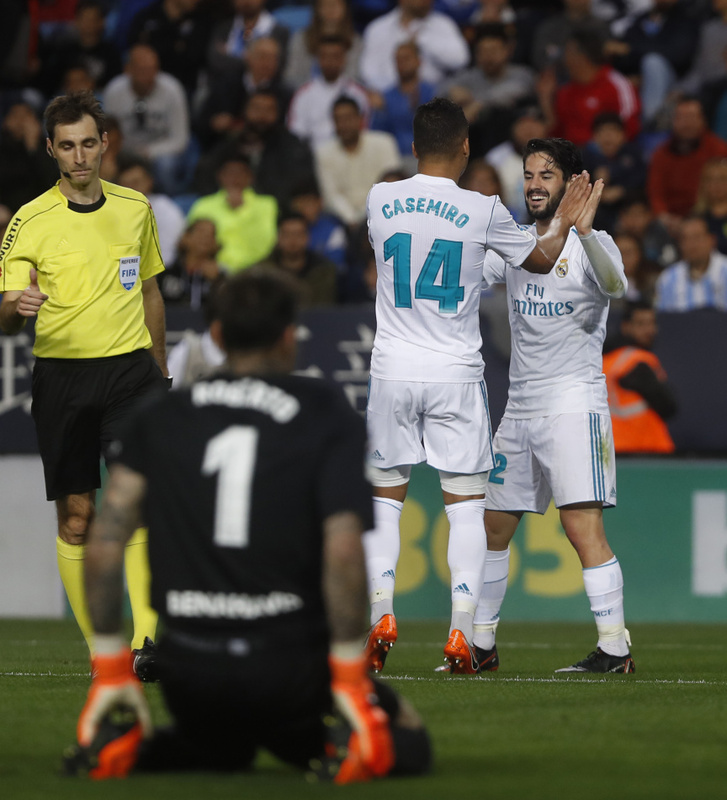 Isco curled a free kick over the wall and out of reach of goalkeeper Roberto Jimenez in the 29th. Casemiro finished off an exquisite passing combination between Karim Benzema and Isco to put the result beyond doubt in the 63rd. Diego Rolan scored for Malaga on the final kick of the match when Jesus Vallejo failed to clear a cross. Defender Damian Suarez scored from a free kick to give 10-man Getafe a 1-0 win over Espanyol. Getafe's Mathieu Flamini was sent off with a second yellow card with a half-hour remaining. Alaves beat Eibar in a Basque Country derby to move further away from relegation danger, thanks to an early goal from John Guidetti.